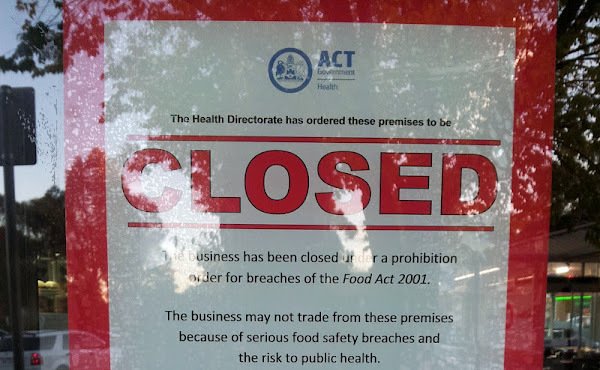 The ACT Health Protection Service is inflicting significant damage to Canberra’s food industry whilst failing to address serious shortcomings in their own processes and procedures, according to ClubsACT’s Chief Executive, Jeff House. “HPS continues to shut down Canberra’s restaurants whilst failing to act on the recommendations of the Auditor-General’s report which found serious shortcomings including inadequate record keeping and a complete absence of a formal policy or procedure to guide staff in enforcement. “We’re now six months on from the Auditor-General’s report and despite the Chief Minister’s request in February that the Health Protection Service work closely with industry, they continue to be reactive and are failing to engage the industry to make sure they understand the new laws. “I call on the Health Protection Service to immediately release a document which details how the laws are enforced and how inspectors make decisions in relation to the closure of venues. Surely, six months after the Auditor-General’s report told HPS to develop such a document and after multiple high-profile restaurant closures, HPS should be able to immediately release this document”. Those letters were sent out after the rules had already changed and after businesses had already been closed by the new rules. SO letters were sent out after the rules changed…I am not seeing the issue here. If they sent out letters categorising the issues and then changed the rules then that would be an issue, but you just admitted the letters were sent after any rules changed. It seems to me there is a lot of bleating by a bunch of restaurant and cafe owners who got away with too much for too long and the shortcuts they took became the accepted norm. It time to get your affairs in order and stick to the rules instead of being lazy with them. Nobody minds if HPS enforces rules in a consistent way. Don’t you think the clubs are more likely than most businesses to have solid policies and procedures to keep themselves out of trouble? If the clubs and hotels are concerned it’s for the same reason everyone is concerned: the rules are being enforced inconsistently. I heard the discussion on 666 this morning, and I thought John Woollard smashed it. He said that he had written to every business in the industry in the ACT 3 times informing them of their obligations, including categorising the types of things being examined, and went on to say that the law hadn’t changed in 10 years anyway, so none of this was new. I’m no fan of govt, but on this occasion they put ClubsACT pretty solidly in their place. And no, I don’t work for, with or have as a client the ACT govt. ClubsACT haven’t won any friends with this one. Is there a less edifying sight in politics than that of an industry lobby squealing when a regulator somehow evades complete regulatory capture? This is exactly why speeding is such a big bad thing. Not because of how dangerous it my or may not be under various circumstances, but because it can be very accurately measured. If you do 60 you are fine, 61 and you are a public enemy, crying out for the ban hammer. The food industry is simply looking for such a specific rule that they may have broken, so that they can get on with their lives with an eye on the speedo and no attention on the road. This seems reminiscent of people complaining about getting caught speeding when they didn’t know there was going to be a speed camera there. If there is no publicly available set of standards which the restaurants are required to meet, then one could cry foul. However, when the standards are clearly specified, and have been for a long time, I’m not sure that whining about the fact that the regulatory body is now actively enforcing those standards constitutes a particularly compelling argument? There’s a speed limit. If you don’t speed, you won’t get a fine. There are food preparation & handling standards. If you meet them, you won’t get shut down.